Zig Ziglar said, “I believe that being successful means having a balance of success stories across the many areas of your life.” Living a balanced life is essential. It’s important to understand some seasons of life requires focusing on certain areas more than others. For example, when starting a business or launching a new product your time will be focused primarily in the area of your career/dream while overlooking some of the other areas. Though once the business is stable or after the launch time it’s important to refocus on the areas we might have neglected. We have to remember that we can’t neglect one areas of our life for a long period of time without the other areas being negatively impacted. Long term success is about having a balanced life. 1. Evaluate your life- Taking into account your current leadership responsibilities and life demands it’s important to take a personal inventory of your life. This is about setting aside time (on a regular basis) to evaluate how you are doing in each of the above 7 areas. It might be beneficial to get an outside perspective about your life and priorities from a trusted colleague or family member. An outside view can allow you to gain a proper perspective about your life and main areas of focus. 2. Determine your priorities- Knowing your top priorities and areas of focus is essential when it comes to living a balanced life, both in your personal and professional life. After you determine your top priorities make sure you guard those areas. If you’re able, delegate or avoid as many things as you can that are not considered a top priority or focus area. This does not mean you should neglect something you should do that might not be in your top priorities. 3. Make necessary adjustments- After evaluating your life and determining your top priorities you might have to make some adjustments. It might reveal areas you have been neglecting but that need to to be refocused on. I personally know now that I’m a parent, a lot more of my time and energy needs to be concentrated on my family rather than something important but not as necessary. I’ve had to make that adjustment so my family remains my top priority. Readjust your life (if necessary) so your focus is on the areas of your top priorities and core values. Questions: How do you maintain a balanced life? 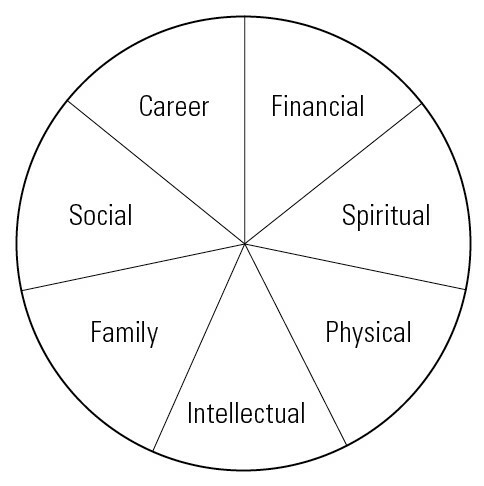 Which of the 7 areas on the Wheel of Life do do well in and which ones do you need to refocus on? This is the first time I’ve seen this model from Zig Ziglar and I really like it. I think these types of models are very useful in helping us to maintain balance in the key areas of life. Indeed, we can achieve so many things in life through work and business and as we do, our influence will continue to increase. However, when we get older the things that will matter to us the most are our families and friends. I like to look into the future every so often and reflect that I don’t want to be someone who regrets not having spent enough time with my close ones. This helps me to maintain a balance in the here and now. I’m glad you enjoyed the Wheel of Life! He includes some important areas we should focus on. Great points, I also want to make sure my friends and family are a key factor in where I spend my time. I don’t want to become “successful” and have no one to share that success with because I isolated or disconnected from the people I love to achieve that success. You have a great core value in making sure you take time for friends and loved ones. Thank you for reading and adding to the discussion. This is so true Dan. You only have so much time in the day, and attention to give. If you’re intent on achieving something of worth in any particular area, you will have to devote more of your time and attention to that goal. And other areas of your life will necessarily be given lesser attention. But if you try to give equal attention to all areas of your life at the same time, you only spread yourself thin. By trying to achieve everything, you actually achieve nothing. Life is a constant flow. Sometimes the current goes this way, sometimes it goes that way. Hopefully by the end, the stream widens into a calm peaceful drift. Balanced. But until that day, you’d best be willing to devote yourself to what’s important WHEN it’s important. That’s why it’s so essential that we know our main areas of focus, it it can guide us toward our focus/goal throughout the day. It’s amazing how much my life has shifted since having my son:) It’s great but a lot of my energy elsewhere is often spread thin. Thank you for reading and adding to the discussion. I maintain balance in life by seeking wisdom, first from God Himself and secondly from Godly people. I try to always remember that balance is relative, so I should not compare balance in my life to balance in another’s life. Get ideas, yes, but refuse to evaluate myself based on comparisons. I also regularly evaluate balance and make necessary adjustments as the seasons of my life come and go. I have been WAY out of balance before, and I hope by the grace of God to never return there again. Great way to maintain a balanced life! Good point about not comparing our life with someone elses, at times I struggle with that one. I see other people accomplishing so much online (writing books or a lot of content) and since having my son my focus can’t be like it was before. Though I still devote a significant amount of time and effort growing my platform and writing my eBook(It’s amazing how slow the process is with a 18 month old and all the other things in my life:). Thank you for reading and adding to the conversation. I appreciate you. I like your thoughts on Seasons. i think that when we don’t accept that life can be seasonal, we put unnecessary stress and burdens on ourselves by thinking we’ve neglected important things, not understanding it’s seasonal. I maintain balance primarily though prayer and seeking God. I can be all over the place But when i seek God, I find that the rest of life tends to fall into place, He pushes me towards intentionality and wholeness. That’s a great way to remain balanced! Great thoughts. Thank you for reading and adding to the discussion. Great point Ngina. One slight change I’d make to the Ziglar’s wheel is to take spirituality out and encompass the entire wheel. In that case, we do not tempt to compartmentalize our spiritual life, but rather we should engage all aspects of life with a Christ-centered view. Thanks for the reminder on Zig’s wheel. Hadn’t thought of it in a long time. #2 in your post really sticks out to me because I dont think the wheel can be in balance without the priorities written down and adhered to. Those we are in close relationship to must understand our priorities and understand the boundaries (things we may delegate and/or avoid) that we have set to ensure our priorities keep the wheel in balance. – Your post is well thought out, thanks again. Your welcome Charles:) I agree, those two things are closely connected with each other. I’m glad you enjoyed the post and thank you for reading and sharing. Dan, the last 4 weeks have been the busiest at work that I’ve ever had. This has helped my refocus using the three points above. I’ve stopped doing somethings temporarily during this busy season. I’ve prioritized what needed to be done first over the last 4 weeks, and made adjustments in areas that require more of my attention. It has helped me stay productive and focused in the here and now and the important stuff. Good stuff. It’s Juan commenting on my blog again:) It’s great to hear from you bro! It’s sounds like you did/ are doing the right thing. Focusing on your work and not on some other areas for a time is necessary. I pray your able to start focusing on some of the areas you have been overlooking( Which was needed) sooner than later. Thank you for reading and commenting. Determining priorities has been huge for me the last few weeks. I’m really trying to hone in on the areas that I need to spend my time, and cut out all the clutter. ADD kicks in sometimes and I find myself getting distracted from the important things! That’s a great idea since your taking time and effort to start blogging. I hope this post helped you:) Thank you for reading and adding to the discussion. I think the spiritual aspect of that wheel should actually be an overlay on all the areas of our lives. That being said, balance is an aspect I struggle with especially since we tend to spend more time on careers than the others by social standards. This is a good reminder for me though, it’s so easy to get into the “if some is good, more is better” mentality. Thanks, Dan. I totally agree with you Floyd! I hear you, our careers can take a lot of our time and energy. But it can allow us to earn the money we need. Unless we start a business or create a winning product! That’s my goal so I can spend more time in some of the other areas and not so much at a job:) Thank you for reading and adding to the conversation. I think men typically have to spend more time on their careers than in those other areas, but that doesn’t mean God doesn’t come first. I look at my husband’s job as his ministry even though he’s not in ministry per se (he’s a physical therapist), and I do as much of the home front job so he’s able to have more free time when he’s home. I second that Floyd! Great thoughts. As usual, great thoughts, Dan. If you really want to know how you’re doing at home, ask your spouse to be frank and honest in evaluating each of these areas of your life. Ask him/her to list your top three strengths and top three weaknesses and the number one area he/she needs you to improve. This is not an easy process, but it’s worth it! Thank you Justin:) That’s a great person to ask. But beware the truth might hurt, hehehe. I learned that the hard way a few years ago. Great questions to ask each other. Thank you for adding to the topic. I always enjoy reading your comments. This is the wheel I use for balance in my life and Goal setting. I love this because it forces you to make balance in your life and keep all areas of your life in order. Its so important to do, but difficult at the same time to accomplish. I found myself focusing more on my Job the past few years than on my family or spirituality. Its come full circle now, and all areas a becoming more balanced now. Its still a work in progress, but thanks Dan for sharing this. That’s great Lincoln! Though writing this post, I can’t say I’m perfect about living a balanced life all the time. However, I think we both strive to keep a balanced life. Glad you enjoyed the post and thank you for adding your thoughts. Dan, this is my kind of post. Great thoughts. I wrote a post last year titled ‘How to make your vision a reality’ (http://bit.ly/KxUPMS) and the first thing listed was to evaluate yourself in the 7 areas of life. I need to refocus on vocation/professional. I also like #3. One of the things I see that frustrate people with setting goals or living their vision is they try to set everything in stone. And if things don’t happen the exact way they want they easily give up and say goals or vision don’t work. I tell people to make a plan that they review periodically to make changes or adjustments. Life is about changes and adjustments. Glad you enjoyed it:) I’ll check out your post, thank you for sharing it with us. Great points! Yes, we have to be flexible and expect changes to happen to our life and goals. Thank you for taking the time to read and share. This is an insightful and helpful post Bernard! Thanks for sharing. To be honest, balance is something I’m constantly struggling with. As I’ve built something, it’s taking more of my time and I find myself loosing the balance. The thing that has helped, has been sitting down with my wife and discussing certain boundaries. It’s something I think most people struggle with, me included:) I’m sure with your success in life it can be even more of a challenge to remain balanced. But you have some great people around you who can support and hold you accountable. Thank you for reading and sharing. Normally I feel I do a good job at having balance in my life. But, looking at the wheel, I see that I’m probably faltering in the financial area. There’s been slack in keeping track of budgets, etc. That’s an area I’m working on as well. Glad the post helped you see that. I use the wheel you picture in my yearly goal setting – trying to make sure I am intentional in all of those areas. I also use this when working with career coaching clients to remind them that their whole life is not just about their work. That’s great Tom! Setting year goals around the wheel is a good idea. Thanks for this reminder, Dan. I find point #2 crucial in this stage of my life. There’s so much to do; but not everything is a top priority. It’s about balance, as you said so well. Thanks! Your welcome Dave! I hear you, man. Writing this post really caused me to reevaluate and think about my own priorities and areas of focus. It’s about finding those areas that will produce the maximum results with the time and energy we put into them. Thank you for reading and adding to the conversation. I have a natural propensity to give me entirety to one or several wheels at the expense of maintaining a healthy balance. It’s easy for me to excel for the sake of excelling instead of doing it for the glory of God. I know that when I put on Christ, things start to naturally balance out. I understand how that feels Paul. I’ve been guilty of doing the same thing. Several people have commented about putting God around all other priorities or areas which I totally agree. Doing this allows us to focus on God and His purposes first and foremost. Thank you for reading and adding to the discussion. As always, full of great thoughts! I am posting something soon on someone’s take on not having balance in life….and succeeding because of it. Another interesting viewpoint. Really enjoyed this post. Thank you Skip. I’m looking forward to your post. Thank you for stopping by to read and share. I appreciate you. Dan – thanks for asking the important question hear about our areas of a balanced life. One thing that I’ve recently adopted is a family values list. It’s an effort to help our family make decisions, and evaluate various competing requests. In many ways it echoes point number three – make necessary adjustments. It’s important to reflect and think about our life and the different focuses we have. Having a “family values list” is a great idea! I might adapt that into my own family:) Thank you for sharing. Dan – it is a great idea! I can’t take credit for it though. It was something I was chewing on, but John Maxwell’s blog post helped me take action on it ( http://www.johnmaxwell.com/blog/win-big-by-creating-your-own-rule-of-5). What I like is when I have a decision to make, I can look at that list and quickly determine if it fits. Plus our family can work from a similar mindset or attitude everyday. Nice, thank you for sharing the source. I’m going to be checking it out. Thank you for mentioning it. Glad the post made you think:) How did our second speech go? I think it’s important to find out what areas we are doing well in and not only the ones we are needing to focus on more. Thank you for reading and adding to the discussion. It went well – speaking is much easier than writing for me. Ah, balance. The thing we all need so much in our life, but find so hard to do. I think it’s such a good idea to try and strike a balance in your life. We have so many committments and responsibilities to do and any one of them can overwhelm us. I try to balance everything in my life by simplifying things. It gets harder the more complex life becomes. When you have less things to keep track of and make complex things a little more straightforward, balancing them just gets a little easier. Ya, it’s easier said than done. Living a balanced life is something that requires constant focus and maintenance. Great point about “simplifying things.” Thank you for reading and adding to the discussion. Great post Dan! I’ve been studying goal setting since the beginning of the new year. It has been great to learn from legendary personal development experts like Zig Ziglar, Jim Rohn, and Brian Tracy. Thanks for sharing this!